The original YIG (2.0 – 4.0 Ghz) doesn’t deliver enough output. 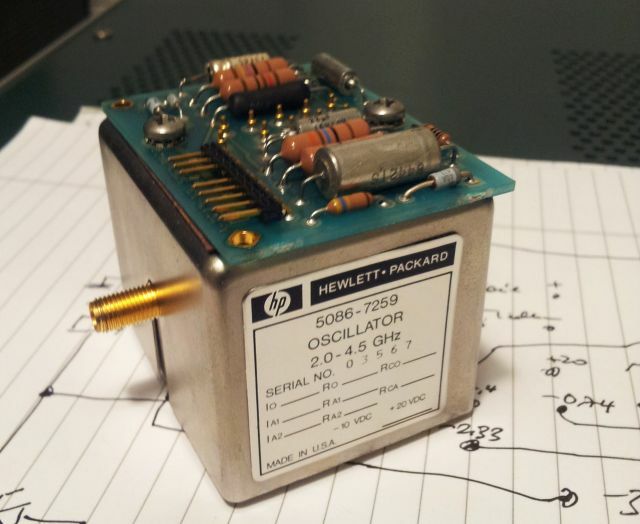 I sourced for an alternative YIG that should be a close match (5086-7259 YIG Oscillator: 2.0-4.5 GHz, 15-18 dBm). When I attach my simple RF amp. meter it shows +5db which is still 10db lower then I hoped for but I continued to make the connections. I used external power supplies as the voltages differ from the original one (+20v, -10v). 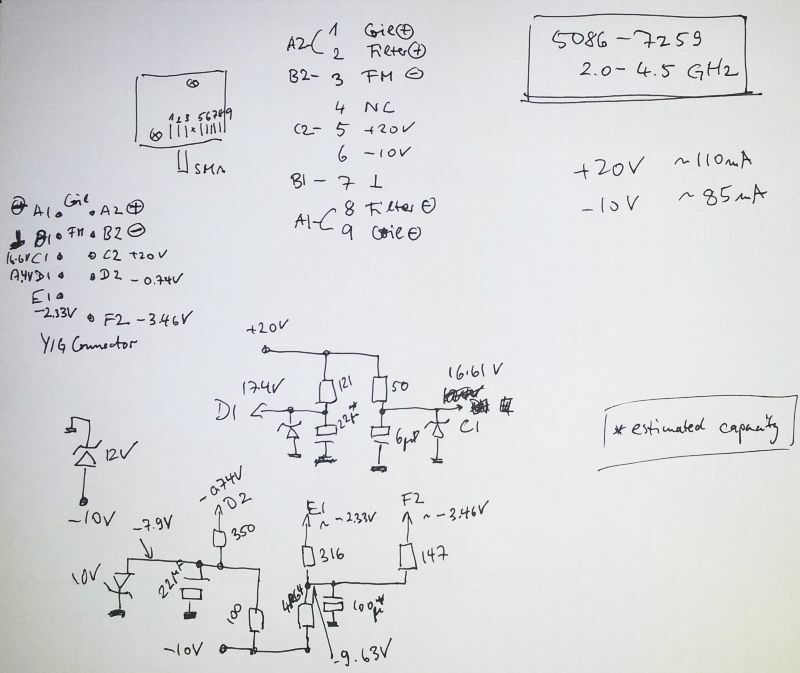 My first question would be if it is save to use the analyzers power rail from -5v to +15v to come up with the required +20v without the risk of running into some ground loops? The required current to control the frequency is different from the original one, I placed a resistor in parallel to the main coil to shift the frequency downwards and it seems to work. I see on the analyzer screen (using int. ref. signal of 300Mhz, -20db) a -29db signal which is out of frequency. I can shift the peak to the right place (e.g.300Mhz) but when I change the centre frequency of the analyzer it is out again and requires again manual interference on the parallel resistor. I see no difference when I connect or disconnect the FM coil (and I am not sure if I choose the right connection), can somebody elaborate how I could best test the function of FM coil ? Any suggestion from somebody who did conversion work in that manner id highly appreciated !! For which instrument do you want to replace the yto? Usually you cant combine -5 and +15 because all voltages are referenced to ground. The fm coil, you can easily check it by applying a 1 khz signal from any function generator and monitor the output modulation on a spectrum analyzer. I am working on an HP8590L, my problem is, that I dont have another spectrum analyzer. i bought a cheap and simple RF amplitude meter whereby I have to input the frequency that I expect the max output on my YIG is +5db. Do you think that should work and is here a way of testing the FM coild etc with the analyzer that is under maintenance by interpreting the responses visible ? The FM coil itself, you could just test if it has good resistance – usually the FM coil never fail in another way than being open circuit because of too much current. Resistance may be a few ohms, it is just a small coil of thin copper wire. Another way of testing, in case you have another source of similar frequency, you could mix it down to a low frequency like 100 MHz and use a USB SDR stick or similar low cost receiver to detect the difference frequency, then you can easily check the FM action by watching the signal and feeding some audio to the FM coil. Since the old yig and new yig have diff. Resistances on the coils i tried to utilize the analysers main coil current by adding a parallel resistor. I can see some response on the screen but the pll seems nit ti find the correct value. Any suggestion on that front? I would suggest you put the analyzer in zero span mode and adjust the parallel resistor to see if it will phase lock. You can also check at various frequencies to see if lock is possible at any frequency. When I connect the input to the 300Mhz reference signal from the analyzer and I set the center frequency to 300 then I see the spike somewhere near by e.g. 360Mhz. I then adjust the parallel resistor to center the spike to the center. But the thing I don’t understand is, that if I then change the center frequency the supposingly 300Mhz reference spike becomes off frequency again hence my resistor adjustment seems not to be working correctly anymore. When I try to run Freq Cal. it cant find the ref. signal. Is the FM coil under all settings required to set on the correct frequency ? And could the calibration routine cater for different resistances on the FM coil (my old YIG had 0.55 Ohm the FM coild versus now 1.7 Ohm). The old YIG got 12.6 Ohm on main coil versus now 52.2 Ohm. But my new YIG only requires I believe around 42mA to initiate 2 Ghz, hence I could work with a parallel Resistor. Not sure what to do with the FM coil. The resistance has little impact, because it is current regulated. Rather than adding a resistor in parallel to the coil, you can try to adjust the sense resistor of the current driver. The coil has a dynamic resistance so it is quite possible that the analyzer cant work with, the coil and resistor in parallel.